Princely tells all from the first few days of the Tamilnadu Run 2018. We can’t believe it’s time for another Tamilnadu Run. It doesn’t seem a year since last time. 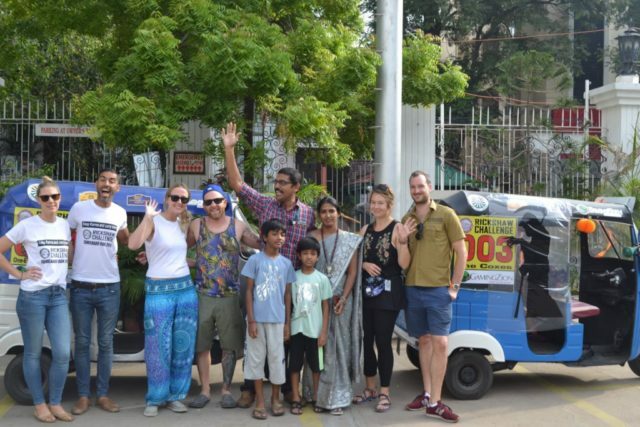 This event is the shortest on the Rickshaw Challenge calendar, which gives teams a chance to really get to know Tamilnadu and its amazing cities. Anyway, this year’s Tamilnadu Run began this Saturday in Chennai; here is Princely with all the details. The last rally in the calendar year is compact, starting and finishing in Chennai. 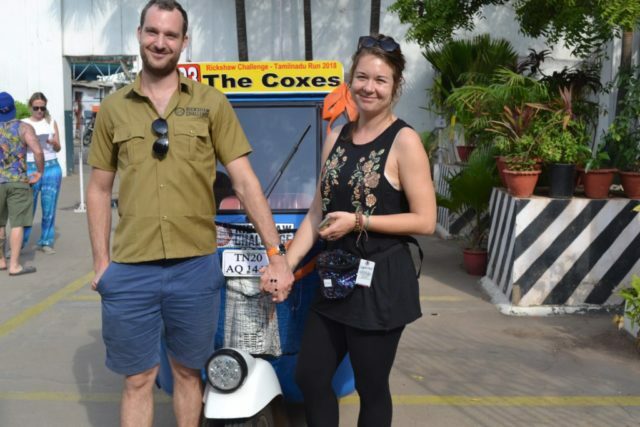 Covering the states Tamilnadu and (briefly) Pondicherry, this is an amazing rally for participants who want a more relaxed experience than is possible on some of our other events. This rally has three teams of couples from Canada and UK. There is one participant from Polond, but even she is residing in London for a long period of time. Beginning from Chennai is a great advantage for me as I can start from home for the registration. Mentioning 3 teams does not mean that my work will be any easier, as all the remaining elements of rally are intact and punctuality is no less priority than in any other events. Sharp at 9 the organization team set up the registration counter in the lobby of the base hotel. The first team to arrive at the registration was ‘The Coxes’. The Canadian Team ‘One-Eye wonder weasels’ was the next to follow. The third team ‘Keep Karma and Carry Omm’ had their pick-up from airport scheduled at 10.45 am. By calculating the time, we could presume that they would not make it to the hotel until 11.30 am. Thus the briefing was scheduled at 11 am was postponed to half an hour. Our staff kept tracking the pickup driver and to our relief everything went on smooth and the team arrived at 11.45 am, only 15 minutes later than we anticipated. The briefing went smoothly in spite of the delay. Straight from the airport and having just completed some 20 hour of journey did not slow down Team 2. Just a shower freshened both the members of the team but by the time they came for the practice they were absolutely enthusiastic and rocking. The second session, at the Practice ground, went as smoothly as the briefing. The only let down was learning that none of the female compatriots are going to drive. It was just three drivers to teach. As all had done bikes and manual gears, it was only a very short time before they learnt the art of driving three wheels. 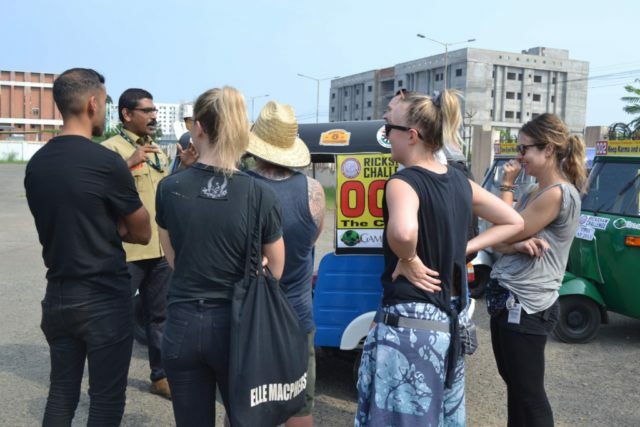 After teaching them the basics, teams were let loose on the crazy Indian traffic. Then it’s like taking the bull by its horn. All the teams were brave enough and they were raring to go. First drive was to fuel and then to the base hotel. 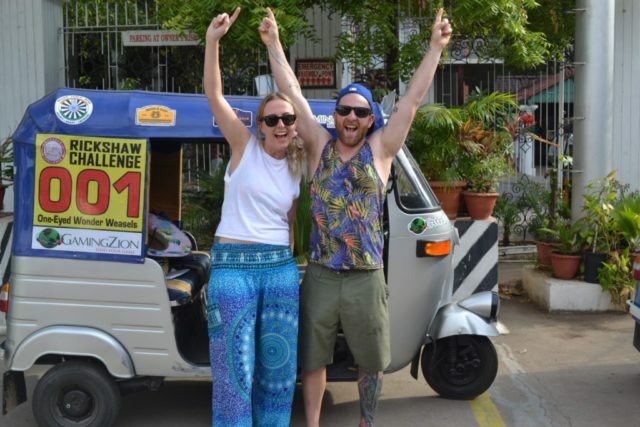 All went well except for Team 2, who had some issue, finding the rickshaw kept rolling and they needed a little support to reach the hotel. Thus the first day came to a close at the fellowship, arranged in Elements hostel. The second day involved a mini challenge, which Teams started at 11 am. I sat at the lobby of the base hotel and the support crew was kept ready at the same place. There was no call to attend that day as all the teams finished their task and reached the base hotel safely. On Day 3 of the Tamilnadu Run, the real journey started. I had decided to take my family with the trip as it coincided with the holiday for my kids. So the first thing at the day brief was introduction of my family to the participants. Then it was time to give information on the road, the weather and potential dangers for the teams. We flagged of from the base hotel at 8.30 am, without any hitch. The only break down on the whole day was Team 2 running out of fuel. Reaching Pondicherry well in time teams enjoyed beach and all of them settled early as they were tired by the drive in the hot sun. All photos in this blog are the property of the Travel Scientists.